they are excitingly colorful and make the person wearing them appear in fashion, vibrant and totally in vogue. Sterling Silver is a beautiful precious metal and the metal of choice by new age people worldwide, Sterling Silver Turquoise Jewelry is an American heritage and Sterling Silver Turquoise Hoop Earrings have all of the properties of desirable new age Jewelry. 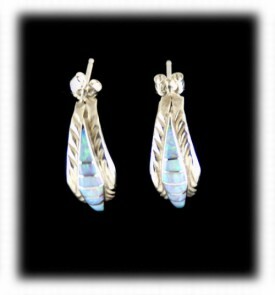 This presentation page has been created to provide you good information about Turquoise Hoop Earrings. information intended to help you understand the different types and styles of Turquoise Hoop Earrings as well as how they are made. Above and to the left is a pair of Zuni Indian handcrafted Turquoise Inlaid Hoop Earrings - This pair of hoop Earrings were created in Sterling Silver by using a top layer of silver that has been cut out with a Jewelers saw and then overlaid onto a back Silver sheet. The Earring is cut, filed, sanded and shaped into a hoop shape and Silver ear posts are soldered on. Next, individual pieces of Turquoise are hand cut on a lapidary machine to fit in the channels or voids that were sawed out. The Turquoise Hoop Earrings are then finished sanded and then buffed out on a Jewelers Buffing machine with a cutting compound, washed and then buffed again with a Jewelers Rouge which make them shine like a mirror. To the right is a pair of Zuni Petit Point Hoop Earrings made with Sleeping Beauty Turquoise. There are twelve finely cut rectangular Turquoise stones in each of the earrings totaling twenty four Turquoise stones in this pair of Turquoise Hoop Earrings. The Silverwork on this pair of earrings is beautiful as well as there have tiny Silver raindrops between each stone. 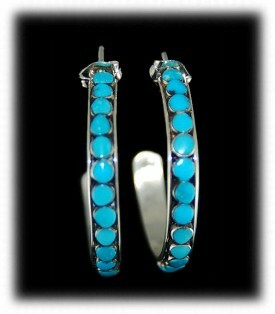 This is a great pair of Zuni Turquoise Hoop Earrings to add to your Turquoise Jewelry collection. This pair of Petit Point Earrings was made by cutting a piece of Sterling Silver sheet to the desired width, shaping it into a hoop, soldering a ear post on the top-back and then soldering on the Silver bezels to hold the Turquoise Stones. The Silver Bezels are pre-made by wrapping the Silver bezel wire around each stone, cutting it to size and then soldering it together with hard Silver Solder. Once the bezels are soldered on the sheet, the silver scraps are cut into equal sized pieces of Silver and then a torch is used to melt them into tiny balls called raindrops. The raindrops are then soldered between each bezel which dresses up the Silver Hoop Earring design. The Turquoise Hoop Earring is buffed like the Earrings above and then the tiny Petit Point Turquoise stones are individually set into the Silver bezels and the bezels are pushed up against the Turquoise stones to hold them in place. Above and to the left is a pair of Zuni or Navajo Indian Cluster Turquoise Hoop Earrings. This style of Silver Hoop Earring is made by both the Navajo Indian Jewelers as well as the Zuni Jewelers as it is a classic design that has been in demand for decades. 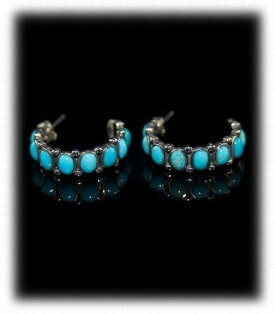 This style of Turquoise Hoop Earring can be found in Sleeping Beauty Turquoise, Coral and other colored stones. These Silver and Turquoise Hoop Earrings are made with individual Sleeping Beauty Turquoise cabochons bezel set and then applied onto a Sterling Silver sheet, tiny Silver Raindrops are soldered in place and the Earrings are finished to perfection. To the right are a pair of Zuni Turquoise Inlay Earrings - This style of Inlay Turquoise Hoop Earrings are classic to the Zuni Jewelers as they originally made this design in Zuni Turquoise Inlaid Wedding Bands. The design became so popular that the Zuni Jewelers began creating lighter weight Silver and Turquoise Hoop Earrings to match the Wedding Rings. This style of Inlay Zuni Turquoise Earrings are beautiful when worn and are the type of Earring that will be handed down to family members for many generations to come. Above and to the left are a beautiful pair of Zuni Needlepoint Turquoise Hoop Earrings. Notice the Sleeping Beauty Turquoise Stones are in the shape of an eye of a needle, this is why they call this needlepoint. 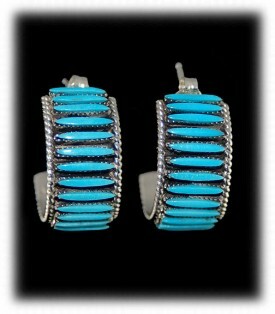 Zuni Artisans prefer Sleeping Beauty Turquoise and most of their sky blue Turquoise Stones are usually Sleeping Beauty. This pair of Silver and Turquoise Hoop Earrings were made by cutting the needlepoint stones and then fitting Sterling Silver bezels around each individual stone, then soldered together with hard Silver solder. The Artisan then creates the Silver Hoop Earring with Silver sheet and edged with twisted Silver wire, then the Silver is cut and shaped into a hoop. 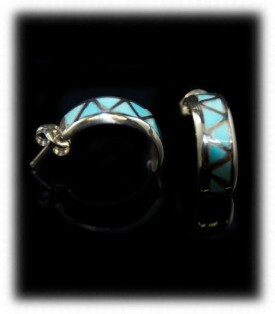 The Silver bezels are then soldered in place and the Turquoise Hoop Earrings are finished much like the Earrings above. Above and to the right is another type of Zuni Turquoise Hoop Earring - This Hoop Earring was made by cutting Sterling Silver tubing into the same sized pieces. Next the short pieces of tubing are soldered onto a Silver hoop that was previously made, small round wire is then soldered next to the tubing bezels and the Earrings are finished for inlay. Next the Zuni Artisan cuts each individual Turquoise stone to fit the tubing bezels and glues them in with high strength epoxy. The Artisan then grinds, sands and polishes the Turquoise stones down to the bezels and then completely finishes the Turquoise Hoop Earrings to perfection, it is quite a process! Above and to the left is a nice pair of Zuni Silver and Turquoise Hoop Earrings in Sterling Silver with multi colored gemstones. 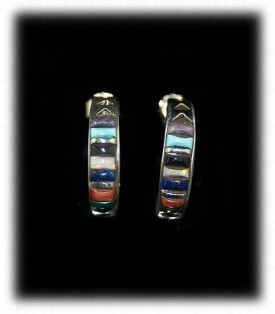 This pair of Silver Hoop Earrings have Turquoise, Coral, Opal, Lapis, Sugilite and Jet gemstones hand cut in a corn row design. The Silver work was created much like the Earrings above creating a channel or void for the gemstones to be cut and set in. Each gemstone is individually cut in the shape of a kernel of corn and then epoxies into the channel. 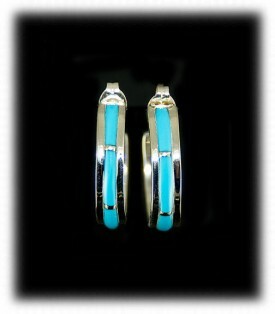 The Silver and Turquoise Hoop Earrings are then buffed and polished to be completed. Again, this is time consuming and technical work and if when you see this work in person you will now know just how wonderful Zuni Indian Jewelry is. The pair of Zuni Indian Inlay Hoop Earrings on the right are another style of Zuni Indian Artistry. This pair of Silver Hoop Earrings are actually half hoop Silver Earrings that have hand stamp work as well as channel inlay in an elongated diamond shape. This pair of Silver Hoop Earrings were made by creating the elongated diamond bezel channel to house the stones and then they were Silver soldered onto a Silver sheet. The Silver sheet was hand stamped and then cut to shape, then shaped in a half circle to create this half hoop Earring. The Silver was buffed and pre-finished and the Opal gemstones were then cut to fit in the Silver channels. The Opal Hoop Earrings were then sanded and polished to perfection. Zuni Artisan handcrafted Jewelry is labour intensive and their work is highly respected worldwide by collectors as well as Gold and Silver Artisans. We hope you have gained some useful knowledge from our Turquoise Hoop Earrings educational presentation page. We invite you to learn more about Silver Jewelry, Indian Jewelry and Turquoise Jewelry by following the links in our Learning Center which has many other informational pages that we have written on topics related to Southwestern Silver Jewelry. In addition, we would like to invite you to join our E-Mail Newsletter - about once every other month we send out a Newsletter to inform our members of what's happening with Durango Silver Company, new products, specials for our members and more. We also have a monthly drawing from our members to Giveaway free Turquoise Jewelry from our company. Please take a moment to become one of our friends and future winners in our giveaway by signing in below. Thank you for reading our Turquoise Hoop Earrings page.